From within your Blackboard System Administrator account select System Admin from the navigation bar. 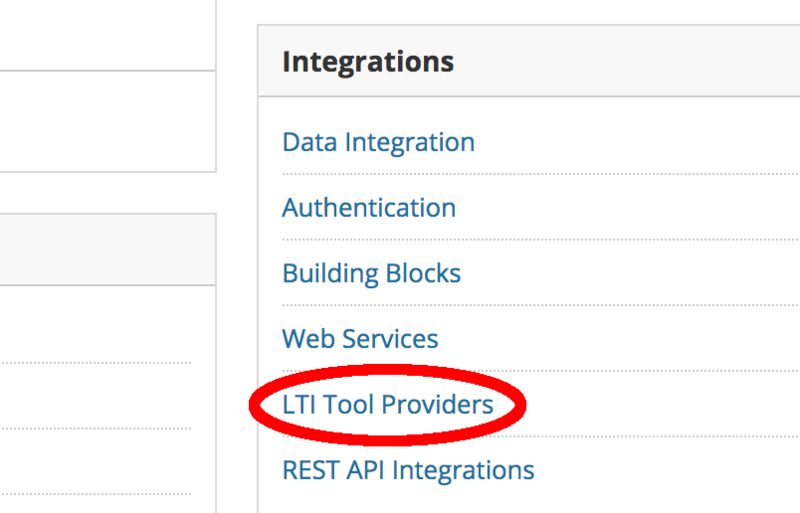 Scroll down to the Integrations section and click on LTI Tool Providers. Select Register Provider Domain from the navigation bar. Under the heading PROVIDER DOMAIN STATUS set the Provider Domain to app.peergrade.io and make sure that Provider Domain Status is set to Approved. Under the heading DEFAULT CONFIGURATION set the Default Configuration to Set globally. Set the Tool Provider Key and the Tool Provider Secret which were provided to you by Peergrade. No custom parameters need to be set. 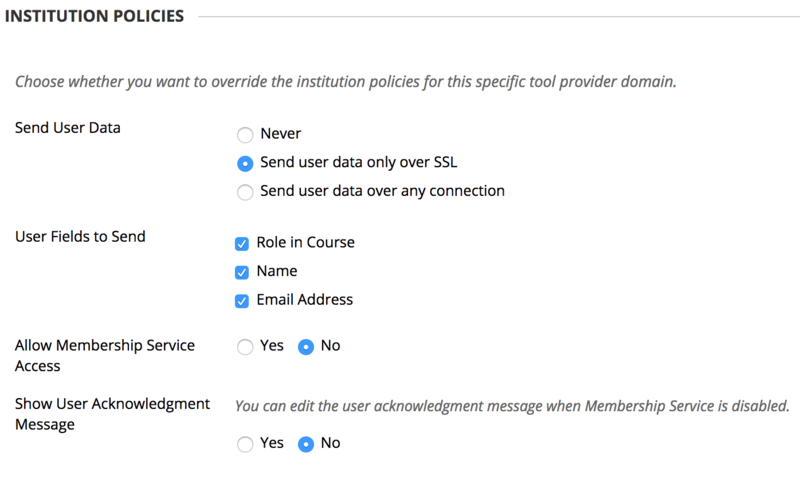 For the INSTITUTION POLICIES set Send User Data to Send user data only over SSL. For the User Fields to Send select Role in Course, Name and Email Address. All other settings can be left as they were. You should now be back on the LTI Tool Providers page. For Label choose Peergrade, for Handle choose peergrade-course-tool. For Availability choose Yes and for Type choose Course tool. Make sure that Students is ticked, so that Peergrade will be avaiable to students. Launch in New Window can be left unchecked, and Icon can also be left blank. Tool Provider URL should be https://app.peergrade.io/lti/entry/course-level/blackboard. Tool Provider Key and Tool Provider Secret should already be filled out with the information you provided earlier. Leave those fields as is (they're normally locked). Tool Provider Custom Parameters should be left blank. Peergrade can be found under "Tools" in any course. We recommend adding it directly to the course menu, such that students and teachers can more easily find and access Peergrade. You can follow the guide on how to do that below. In the small modal or window that pops up, there should be the Name, Type, and Available to Users. In the Name field type Peergrade, in the dropdown next to Type find and click Peergrade. Make sure Available to Users is ticked. Lastly click the Submit button at the bottom of the page. Great! 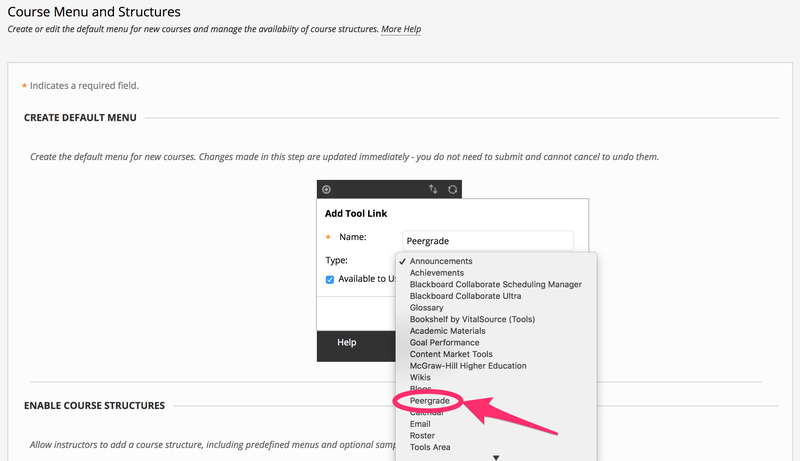 When you create courses in Blackboard from now on you will have Peergrade available in the menu for both instructors and students. For existing courses you can either manually use "Add Tool Link" in the menu inside the course, or use Course Structures. If you are in doubt about how to do that, feel free to write us by using the help chat in the lower right corner.